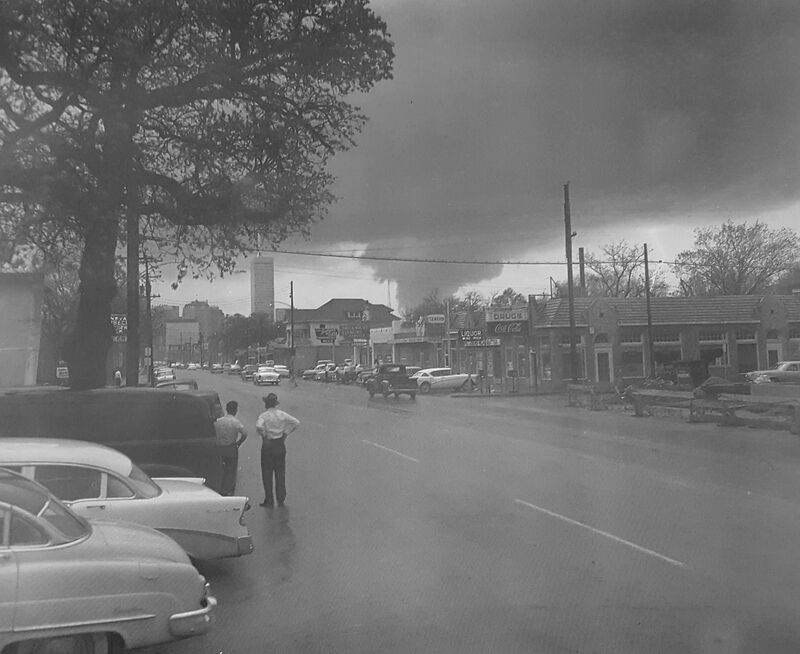 Great shot of the historic Dallas tornado (which killed 10, injured at least 200, and left about 500 people homeless) as it was plowing through Oak Cliff and West Dallas on April 2, 1957, seen from the 2800 block of Live Oak. Aside from the tornado, this is an interesting view looking toward downtown, the Medical Arts Building, and the Republic Bank Building (that rocket must have been Dallas’ tallest lightning rod at the time!). The building containing the strip of businesses at the right still stands (I love these buildings — there are a lot of them in the older parts of town) — a present-day view can be seen on Google, here. What stood out to me was a Burger House — I didn’t know of any other than the one on Hillcrest, but this one stood at 2811 Live Oak from 1950 or ’51 until about 1976. Top photo from the book Historic Photos of Dallas in the ’50s, ’60s, and ’70s by Rusty Williams (Nashville: Turner Publishing Company, 2010); from the collection of the Dallas Public Library. Film footage of the tornado can be found in several videos on YouTube, here. One of the newspaper reports on the tornado which captures the terror felt by those in the twister’s path and is well worth reading in the Dallas Morning News archives is “‘Roar of Thousand Trains’ Precedes the Killer Funnel” by James Ewell (DMN, April 3, 1957). Of particular interest is the story of T. M. Davisson who hid with a customer in a large empty steel tank on his property. A previous Flashback Dallas post — “Tornado As Learning Tool — 1957” — is here. Photo and clippings are larger when clicked. 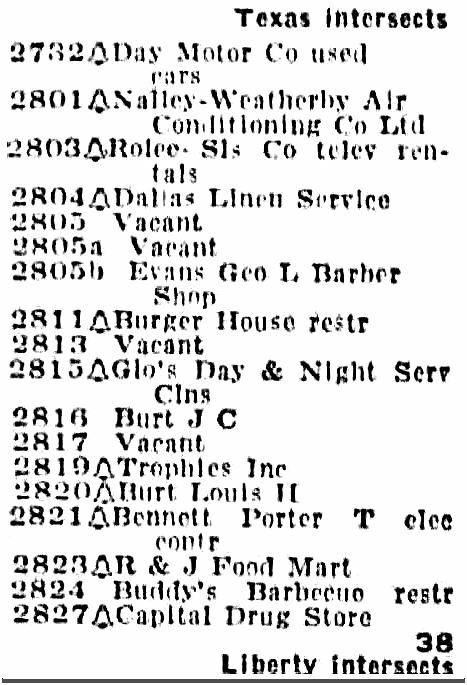 Interesting that one of the firms still remains on Live Oak, but has moved a few blocks up the street–Trophies Inc.
Do you have the 1956 info for the area of 1616 Singleton, mentioned in the article? curious if the building that survived this storm is still there today. It says the woman’s grocery store was there at that time…Manuela Orozco’s grocery. Thanks for clarifying! i end up spending an hour or two when i stray from your site after reading your posts….takes me all over Dallas and to other links relating to what you post! lol thanks for all your work! My grandfather lived with his daughter and two nieces on Willomet Ave. at the time of the tornado. One niece was home when it hit Oak Cliff. The house survived but some of the neighbors’ homes did not fare as well. The same niece was in Wichita Falls when the big tornado hit there in the 1970s! Paula,I was raised in Oak Cliff at 3430 S.Marsalis.Born in 52.I remember it like it was yesterday.I was layin in the livein room floor lookin out the front door.I saw what I thought was a big fire.I told my grand daddy”Pappy.look,there’s big fire over there.He took one look at it and said”boy,that ain’t no fire it’s tornado”!He rushed us all outside and to the car.I stood in the field,a DP&L powerline field,I think it was,and looked at the thing rippin people’s houses apart just down the hill from our house.Pappy grabbed me and said,as he was throwin me in the car”get in the car boy”!When we were all aboard he backed out of the driveway at a high rate of speed,jumped the median backwards and headed south on Marsalis all the way out past the Singin Hills area.He instinctively knew to go directly south as tornadoes always seem to travel south west to north east.And we were due east of the thing about 3 blocks.Man that thing was loud!For some reason I thought it was in 56 but after seein your post I guess it was in 57.Makein me 5 instead of 4.Thanks for your post and pics.Brings back a lot.My grand daddy was kindasorta my daddy cause he was the one that raised me.Mom ran my dad off before I was born cause he was no good.Fine with me.Pappy was the bestest father a kid could have.Huntin,fishin,drivein and everything else there was to learn.Plus his values were old school.And I got em.Thanks again.God Bless you and your’s. Wow. That’s quite a story. Glad the both of you made it out okay!